Can we agree Memorial Day is a solemn occasion? The end of May is special for everyone. Parents and kids alike celebrate the end of another school year; the cold months are safely in the rearview mirror and it’s safe to plan outdoor activities without fear of being frozen- out (though for a lot of us rain is a constant threat). 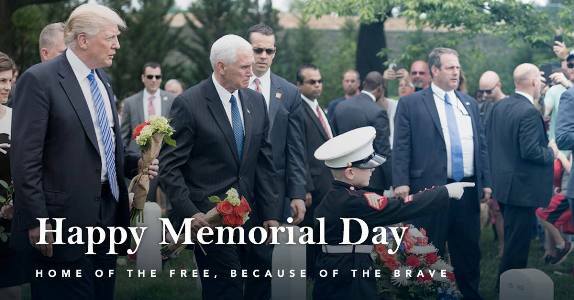 It’s also the time to honor those who gave their lives that this nation might live. Observations of Memorial Day have changed over the years, but the significance of the occasion hasn’t. It’s a degree of gratitude everyone feels for the dearly departed in uniform that never fades. No doubt, the American flag under which these brave souls fought and gave the last full measure of devotion waves proudly every final Monday of May -- and all year long. Perhaps it’s fitting that the NFL took the impending holiday’s approach to finally resolve its flag-protest dilemma. The league’s “solution” (announced last Wednesday) won’t please everyone – or maybe anyone – but at least the ambiguity regarding player demonstrations will be gone once the pigskin is teed up and the football season begins in a few months. Keven Seifert and Dan Graziano of ESPN.com reported last week, “NFL owners have unanimously approved a new national anthem policy that requires players to stand if they are on the field during the performance but gives them the option to remain in the locker room if they prefer, it was announced Wednesday. “The policy subjects teams to a fine if a player or any other team personnel do not show respect for the anthem. That includes any attempt to sit or kneel, as dozens of players have done during the past two seasons to protest racial inequality and police brutality. Those teams also will have the option to fine any team personnel, including players, for the infraction. While the ESPN writers’ report indicated the rule change tally was unanimous, that’s not exactly true; San Francisco 49ers owner Jed York abstained from the vote (though he didn’t signify he was against the proposal). In addition, the New York Jets’ management announced they will not fine players who kneel despite the new official league policy (which incidentally will be added to the operations manual). So, in other words, the quandary could very well crop up again next season, though one would think providing players the option of not taking part in the anthem ceremony would satisfy all-but the most disgruntled. Then again, the players who so visibly went out of their way to “protest” were out to draw attention to themselves regardless of the “cause” they purported to represent. As was argued repeatedly during the hubbub last fall, there are more than enough ways for individuals to speak their mind without dragging the league – and the country – into a debate over the meaning of kneeling or sitting during a perfunctory pregame function. If these token few dissenters are so bent on drawing media coverage, why don’t they use the occasion of Memorial Day or even the Fourth of July to do it? Most NFL personnel (including the owners) claim the acts weren’t meant to be “unpatriotic,” but how else is the average person supposed to take them? Is a guy shelling out a hundred bucks for a ticket in the upper deck to watch a football game expected to empathize with a highly-paid athlete championing a nebulous cause? When you get down to it these flag protesters are being incredibly ingenuine to take part in ambiguous intimations (kneeling for the national anthem to bring “awareness” to police brutality and conditions in poor communities), fanning the flames of social discontent while poorly explaining what they’re up to. At least Colin Kaepernick (who started the whole thing two years ago) had the guts to state outright that he was protesting the flag itself. As far as the owners go, they can’t have it both ways either. With this rule change the owners claim to mandate “respect” for the flag yet they’re still allowing for generous exceptions to the policy. If a player remains in the locker room before kickoff for treatment for an injury, for example, will the team explain the reason why he didn’t show up for the ceremony? Additionally, will the fines have teeth – at least to the point where teams will have incentive to enforce the rules? I highly doubt we’ve heard the end of this topic. Only in post-Obama America do we even need to be talking about such things. Couldn’t the NFL just as easily have adopted an NBA-like policy that requires everyone to stand for a couple minutes before every game? What’s next, sitting or kneeling during the reading of the Gospel in a church service to protest religious oppression? Not a lot makes sense these days, including the media’s shifting explanations for special counsel Robert Mueller’s ongoing investigation. With last week’s revelation that there were “spies” imbedded in the Trump campaign at the behest of top justice and intelligence officials (with almost certain knowledge and assent from the Obama White House) – and the obvious implication that the whole episode began well before the release of the DNC’s hacked emails (in July, prior to the Democrat convention, allegedly perpetrated by Russia) – many are questioning whether there were even grounds for the collusion probe in the first place. #NeverTrumper David French thinks there were plenty of reasons to investigate. French wrote at National Review, “Trump officials have routinely hidden their Russian contacts and concealed their motivations behind a bodyguard of lies. Trump misled America about his reasons for firing James Comey, Michael Flynn lied to the FBI even about non-criminal contacts with Russia, and various administration officials have issued a truly extraordinary number of false or materially incomplete statements about their communications and actions. One wonders if French will put together some kind of “retraction” if/when the Mueller witch hunt (I mean investigation) turns out as it looks to be – a leftist-inspired partisan Democrat shot in the dark intended to discredit and ultimately bring down the only true “outsider” president this country’s ever had. As might be expected French lends undue importance to the (June, 2016) 20-minute Trump Tower meeting between top campaign advisors (Don Jr., Paul Manafort and Jared Kushner) and a Russian “official” who was essentially engaged in a non-governmental related lobbying mission. Many people have pointed out that receiving information regarding an opponent’s campaign is something everyone does. There was no quid pro quo offered and the meeting ended up being the nothing-burger of all nothing-burgers. Sure, the encounter took place – Don Jr. himself admitted to it and even released the email exchange that led to it. It’s been pored over ad nauseum by the authorities and there were no findings of wrongdoing whatsoever. Enough said, right? While French makes a credible case that it was reasonable to begin the investigation (based objectively on the reported “evidence”), would he now concede that since everything has been released – or leaked – it’s time to end the probe? French is right – plenty of people prejudged the outcome because there’s been good reason to do so. It’s well-known Mueller hired an office suite full of biased Democrat swamp creatures to carry out the fact-finding and all they’ve come up with are process crime charges for a few of Trump’s underlings. What a waste of taxpayer money. Further, the “spies” who were unleashed on the Trump campaign basically entrapped stumbling and bumbling clueless staffers into giving the appearance they had something (in terms of dirt on the Russians) when they didn’t. Prime investigation target George Papadopoulos, for example, was talking about an entirely different set of “emails” than the ones that supposedly triggered calls for a special counsel. Papadopoulos thought his Russian informant was talking about the 30,000 missing Clinton emails, not the ones hacked from the Democrat Committee. In the overall scheme of things, don’t you think that fact is important? The truth is, the Mueller affair has been a sham from the beginning. Some say it’s more than about time to appoint a second investigation, this time to get to the bottom of all the damaging revelations on the Democrats. Simon is right on – any additional special investigation must be conducted by someone outside the swamp, and it must be given wide leeway to charge the guilty with any crimes committed. If the Obama Justice Department officials who did wrong aren’t brought to account, the system will have even less legitimacy than it does now. A number of conservatives who aren’t fans of special counsels argue congressional investigations will prove sufficient to deal with this mess. Time will tell, though with the partisan split in the House and the sheer unwillingness of Democrats to acknowledge the obvious writing on the wall, it certainly appears this avenue alone won’t bear fruit. One way or another, the media won’t help get to the truth. L. Brent Bozell III and Tim Graham of CNS News wrote, “Try this intellectual exercise: Imagine that the Justice Department under former President George W. Bush had sent a spy/informant into the Obama campaign in 2008 to see whether foreign powers were attempting to influence its ‘inexperienced and sketchy’ aides. Hundreds of media heads would have exploded. It's safe to say America once stood for principle above personal rank and status – that’s what the American Revolution was all about. The recent deep state assaults on President Trump and Republicans have shed serious doubt on the legitimacy of our system and viability of culture.